Renho, leader of Japan’s biggest opposition party, took the unusual step to disclose parts of her family registry Tuesday to prove she has resolved her dual nationality status, a controversial move that critics say could justify future calls for disclosures targeting minorities. Under the current law, dual nationals in Japan are obliged to choose one over the other by the time they turn 22. The former anchorwoman-turned-politician was born to a Japanese mother and a Taiwanese father. As an opposition leader, “I’m in a position to demand the current administration right its wrongs and fully account for its actions. 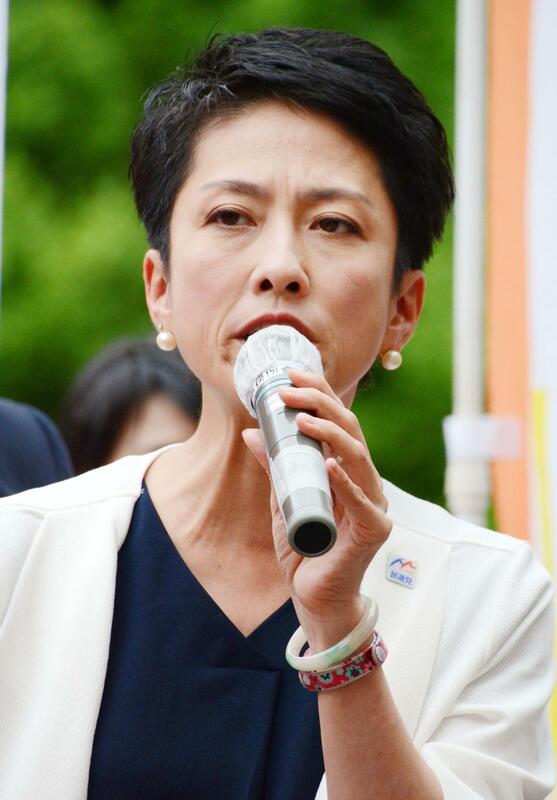 But I thought my words would continue to sound hollow if I failed to dispel public misgivings about what I say” about the dual nationality issue, Renho, head of the Democratic Party, told a news conference Tuesday. On Tuesday, the opposition leader publicly presented personal documents showing that she, after decades of delay, started the paperwork to choose Japanese nationality over Taiwanese during the fall of last year. Included in the paperwork was a copy of her koseki (family registry), many parts of which were redacted to protect the privacy of her family. But the copy included a page that showed Renho, 49, successfully made a declaration to choose Japanese nationality on Oct. 7 last year. This means she had neglected to fulfill her legal obligation to choose her nationality for nearly 30 years, although such an oversight entails no penalty, according to the Justice Ministry. Renho said she was long reluctant to disclose this particular page, because it contained some mentions of her twins. She said she overcame her hesitation when they turned 20, the age of adulthood in Japan, earlier this year. Furor over Renho’s dual nationality — and inconsistencies she made detailing her status — flared anew as some lawmakers within her party cited the saga and the fumbling of the matter as the reason for the party’s dismal showing in the Tokyo Metropolitan Assembly Election earlier this month. While running for the DP’s top position last year, Renho originally insisted that she was Japanese at birth, only later to say she legally became Japanese upon giving up her Taiwanese citizenship at age 17 in 1985. But it was soon revealed she was still in possession of Taiwanese nationality. The ensuing paperwork to drop it, her aides said, was complicated by the fact Japan does not recognize Taiwan as a state, causing further delay. Conservative politicians have used her story as an excuse to call for greater oversight of those who hold citizenship from multiple countries under the pretext of beefing up the nation’s counter-espionage efforts. They have taken issue with the fact that there is currently no law that disqualifies dual nationals from assuming sensitive roles such as becoming lawmakers, state ministers or joining the Self-Defense Forces, with the only exception being diplomats. In a scathing dig at Renho, Liberal Democratic Party lawmaker Kimi Onoda, who herself has an American father, likened those with dual nationality to “spies” on her Twitter account Friday. Renho’s decision to partially reveal her family registry, meanwhile, has ignited the ire of human rights activists and other critics who argue such a move could have dire implications for minorities. Prior to Renho’s news conference, a group of scholars and lawyers petitioned the DP to rethink her disclosure plans. In the petition, they said private information contained in the koseki has traditionally been abused to identify and discriminate against those of minority origins such as burakumin (an outcast class), the indigenous Ainu people, who once occupied much of Hokkaido, and those born out of wedlock. Renho’s disclosure “flies in the face of years-long efforts to eradicate such discrimination, and it’s an unbelievable atrocity that leader of Japan’s biggest opposition party would do such a thing,” Jiro Yamaguchi, a political science professor at Hosei University, told reporters in Tokyo.